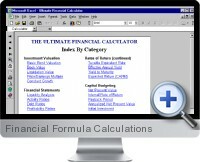 The Financial Formula Calculation Templates for Excel give the resources of an interactive and portable MBA reference guide. Armed with these templates, the user is able to solve the most common financial problems that you encounter on a daily basis. In one integrated Excel workbook, the user can easily select over 40 worksheets from a main menu to solve a wide range of financial calculations. Determine the value of a bond; determine the annual yield for a bond if held to maturity Establish book and liquidity values. Quickly determine liquidity and activity ratios. Calculate debt and profitability ratios. Determine the present value of a single amount, a mixed stream of cash flows or of an annuity. Understand the future value of a single amount or an annuity. Calculate the net present value of an investment with up to 15 years of cash flow; calculate the annualized net present value. Compute the annual rate of return needed to meet a financial goal. Determine the real rate of return and the after tax return; ascertain taxable equivalent rate. Calculate a monthly lease payment for a car. Assess a consolidation loan to pay off debt. Use the refinancing calculator to see if refinancing makes sense. Compute monthly payments and final payment for balloon mortgage . Calculate a loan; calculate a biweekly mortgage; determine housing affordability. Understand your personal safety debt ratio. A trial download is also available on the next page.